It never fails that exciting things happen when I’m trying to stay off the internet, and I can either report them and let myself succumb to distraction, or I can stay off the internet and appear even more oblivious than usual. So yes, while I was gone, I learned that Seraphina is one of the finalists for the 2012 Andre Norton Award. I’m not so jaded by my other nominations that I’m impervious to the tremendous honour of this one. What a wonderful list to be on. I am so very, very awed and grateful. I finished the current draft of The Sequel Unnameable and sent it to El Capitan Pantalones de Editor. The second book won’t be called Dracomachia, I am reliably informed, but what it WILL be called is still up in the air at this point. I am now off to a week or two (or however long it takes) of unbridled napping. That’s right. I’m tired. Thursday evening (7ET) I will be participating in an on-line author chat at a site called Figment, along with fellow debut novelists Alexandra Monir and Elizabeth Laban. It should be excellent good fun. I’ll wake up for it, I promise. I learned today that Seraphina has won a Cybils Award for YA SF/F. My heartfelt thanks to all the nominators and judges from the book blogging community. This is a relatively new award, but Random House notified my editor that I’d won, so I’d say the publishers are taking notice and keeping track. 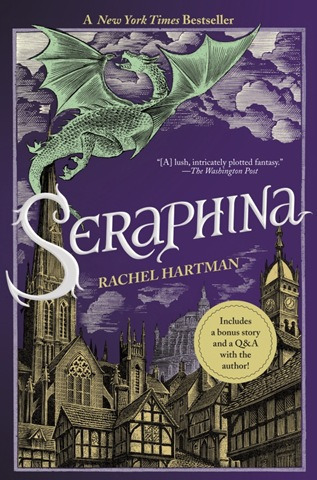 It was also announced today that Seraphina has been short-listed for the Waterstones Prize in the UK. The story made the BBC news site (I’m linking to that story because the title cracks me up. Beavis and Butthead, y’all! Oh, and some other books!). This is a huge honour. The winner will be announced March 21st. I’ll be under my bed. In totally other news, my photographer friend Lauren Zurchin is doing a fantasy authors calendar for charity! Go check it out, and then support her Kickstarter to help make it happen! I’m not in it*, but many other exciting people are, the idea is excellent, and the charities are worthwhile. * Because “Spocktober” is not a month. How was I supposed to know? Is that all we got? Only one thing more: Vancouver has crocuses, ladies and gentlemen. I’m callin’ it for spring! Isn’t it lovely? Although I have to admit “and cease not” sounds a lot like “and see snot” when you’re singing. There was a certain amount of giggling about this, not all of it mine. This video is also super useful for learning the song, since it follows right along with the music. I sang alto (although I managed soprano for “Mille Regretz”, which we also sang). I’m technically a mezzo, I think, and am trying to pretend this is a feature, not a defect. Good for both, not good for nothing. That is to say: there’s belief, and there’s belief! The well, as I recall, is at the bottom of a hillside full of cows. It was pouring rain when we were there. We didn’t sample it ourselves.